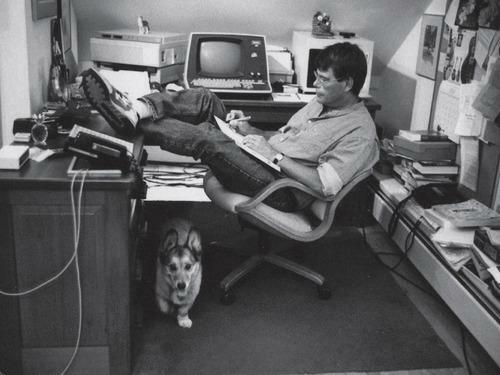 I was sitting here, thinking that it has been a long day and perhaps I ought to write something, anything, when my thoughts involuntarily turned to Stephen King. I’ll be honest and say I haven’t read any of the fiction he’s written in the last, ooh, fifteen or twenty years. But before that…oh, before that I was the teenager devouring every scary word, reading until I had to get up for school again. His books were big (always a plus when you devour them), scary (something I cannot do anymore) and full of story. He also gave me my first taste of how powerful words could be. My school was a mixed ability, mixed fortunes kind of school. In the last couple of years the classes were separated according to ability, but before that it was a mish mash of bright, capable and throwing chewing gum at the ceiling, sitting in roughly that order from front to back. I was toward the front, not nerdy enough to be right in the front row, but certainly not one of the back-chatting, desk scrawling, terrifying kids from the other village. They took up the entire back row, scraped chairs, answered back, were always last in and first out. For one English class we were given the assignment of finding a favourite passage in a book we liked, and reading it out loud to the class. My passion for books was so great that I knew I’d find something to read, but would everyone like it? Would I be inviting a kicking from the kids in the back row? What would my friends think? Would I stumble over the words? And this was before I tackled the horror that everyone would be looking at me. I chose a passage from It. It was too long, but I couldn’t see any way of it making sense to the class if I cut it down. I don’t remember exactly what it was about, but there was some kind of chase and a confrontation, some fear and some resolution. It felt right, but on the day I was still terrified. Most of my classmates read before me, all manner of things: short passages, long passages, but most of them with whoops and catcalls as accompaniment from the back row. I picked up the book. Found my place. Began to read aloud. And then it happened. There was no classroom anymore. There was just me, and the book. As I read, I fell completely inside the story. I was reading aloud but I barely had to concentrate, because the words were just tripping off my tongue, one after the other, as natural as can be. I read, and I kept on reading, oblivious to my surroundings. When I finally got to the end and stopped speaking, it took me a moment to realise that the odd sound I was hearing was the dying acoustic of my voice bouncing off the walls of an entirely silent classroom. Yes, they were looking at me, but I’d been shielded by the words so it didn’t matter. And there were no catcalls because the words had them too, all those kids in the back row. And my teacher, who had looked so disappointed when I had pulled out my ‘trashy’ novel, now looked surprised, but glad. Maybe she’d been waiting for something to shut them up. I learned two things that day. One: Story is king – if you have story your readers will forgive you almost anything. Almost. Two: I love reading aloud. More about that another time.